St Kilda is a unique part of Melbourne with rock music, pop culture and experimental artists mixing it with babes, beaches, boofheads and backpackers. It also has its fair share of lessor thrills with cafes down backstreets, art displays in discarded buildings and, believe it or not, a walking track that is a 1 to 1-billion replica of the solar system. 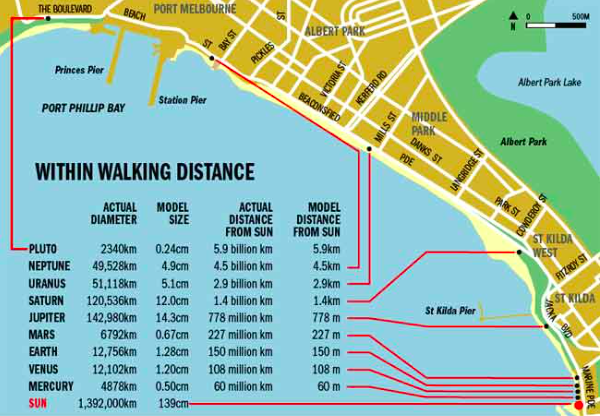 It starts with the Sun, located at Marina Reserve in St Kilda and ends in Port Melbourne with replica planets presented in statues along the 5.9km route. 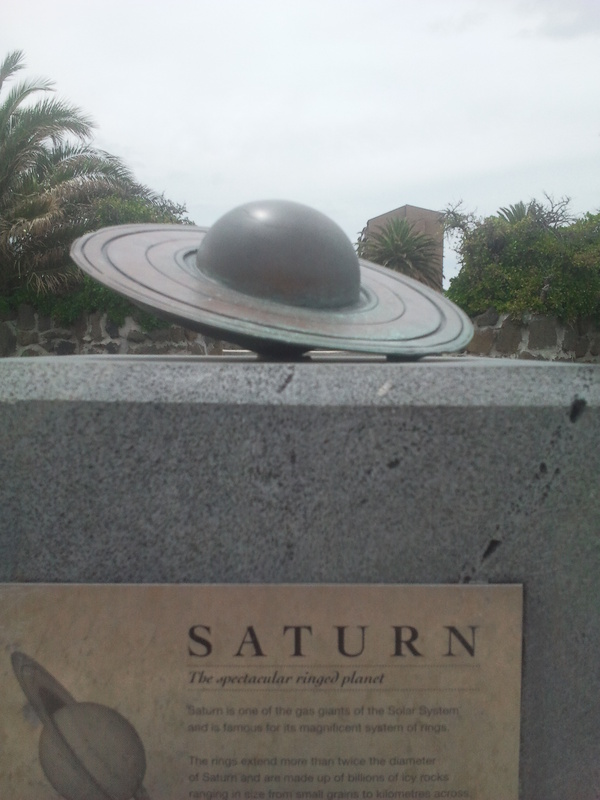 It doesn’t matter how many text books or documentaries you watch, it doesn’t quite sink in how small the Earth is until you make it to Jupiter and see a statue that it is over 1000 times the size. Neither do you get an appreciation of the scope of the solar system until you have walked the first four planets in around 300 metres before taking a 1.6km hike to get from Jupiter to Uranus. Just make sure you take the time to enjoy the walk and the sights along the way. On the St. Kilda end of things you will be ‘people watching’ and it will be a vibrant activity of beach volleyball, roller bladders, artists, sunbathers and teen lovers escaping the glare of their parents. On the Port Melbourne end, you have piers, nice cafes, fishermen and married couples going for their weekend walk trying to escape their teenage children. Give yourself a couple of hours and by the time you reach everyone’s favourite dwarf planet Pluto, you will have earned the right to grab some lunch at the nearby Bay Street.